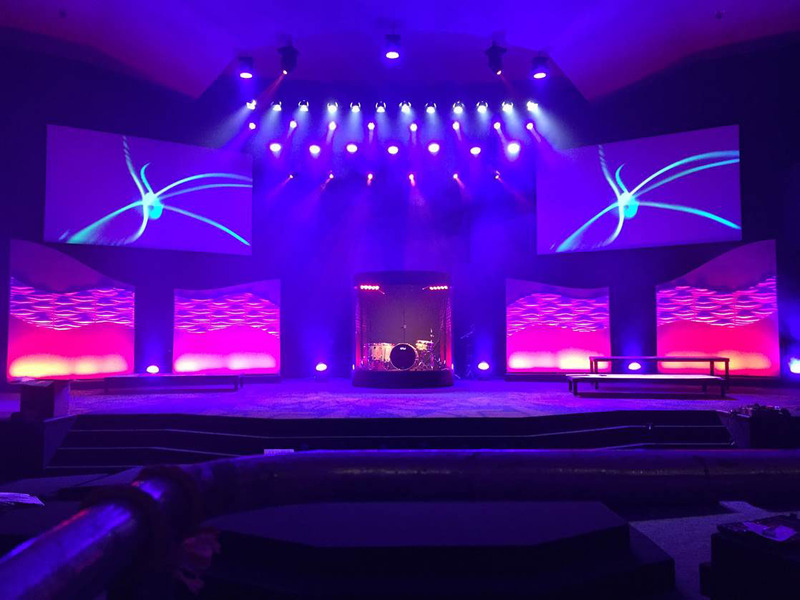 The Bellevue Christian Center, in Bellevue, Nebraska, featuring new audio, video and lighting solutions sourced through Guitar Center Professional and installed by Whiteley Solutions. WESTLAKE VILLAGE, CA, September 24, 2015 — The Bellevue Christian Center, in Bellevue, Nebraska, had a big project to tackle: the renovation of an auditorium that would be used as a temporary sanctuary so its existing sanctuary could also be renovated. It was a huge project, one that generated a lengthy equipment list for audio, video and lighting, and one that would require every item from that list to arrive exactly on time, to keep to the project timeline and to assure that the congregation would have a suitable sanctuary every Sunday during the renovations. That’s why the AV systems integrator on the project, Whiteley Solutions, turned to Guitar Center Professional (GC Pro), the outside sales division of Guitar Center that focuses on the needs of professional users. “We knew they’d have what we needed, and they’d have it on site when we needed it,” says Zach Anthony, the Senior Systems Engineer at Whiteley Solutions. The equipment list was substantial and included lighting systems from Martin, Chauvet, Altman and Elation; audio products from Yamaha, RCF, Sennheiser and AKG®; and video platforms from manufacturers including Vaddio, Blackmagic Design and Da-Lite. The project was scheduled for two phases, the first taking some audio and acoustical products into the church’s auditorium to allow it to be used to hold Sunday services. Once that was done, the work switched to the existing sanctuary, where the vast majority of the equipment purchased through GC Pro would be utilized. 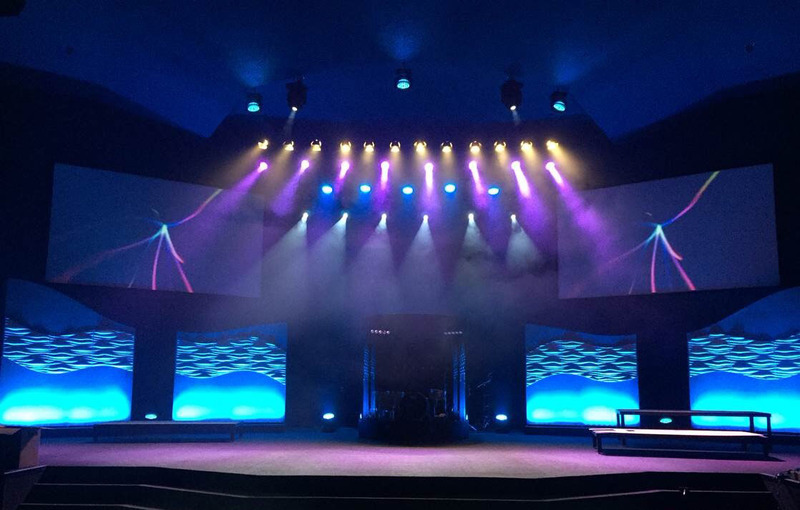 Photo Caption 1: The Bellevue Christian Center, in Bellevue, Nebraska, featuring new audio, video and lighting solutions sourced through Guitar Center Professional and installed by Whiteley Solutions. Photo Caption 2: The Bellevue Christian Center, in Bellevue, Nebraska, featuring new audio, video and lighting solutions sourced through Guitar Center Professional and installed by Whiteley Solutions. 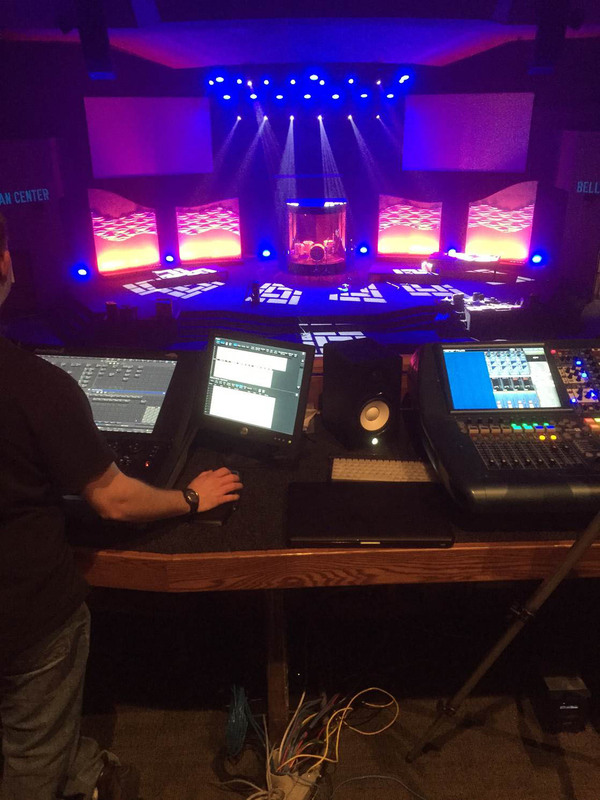 Photo Caption 3: The FOH position at Bellevue Christian Center, in Bellevue, Nebraska, featuring new audio, video and lighting solutions sourced through Guitar Center Professional and installed by Whiteley Solutions.